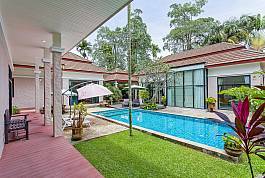 Thammachat Vints 130 Villa is a stylish 3-bedroom abode with a private swimming pool, located in a 5-star gated estate (project #3) with 24-hour security and lots of communal facilities. It is set the Bangsaray countryside, just a 2-minute drive from Silverlake Vineyard and Buddha Mountain, and a 5-minute drive from the beautiful Ban Amphur Beach. 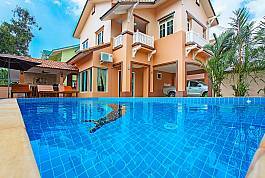 This 3-bedroom villa located on Jomtien 2nd Road, just a 5-minute walk down to Jomtien Beach and close to a great selection of bars and international restaurants. 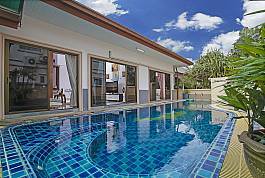 Tropical and cosy, Jomtien Summertime Villa B merges peaceful development living with the most convenient of locations. 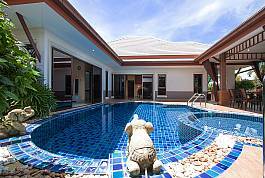 The Villa Jomtien Summertime C offers three bedrooms with a private pool, only a short 5 minute walk from idyllic Jomtien Beach. Unlike Pattaya, Jomtiem is more relaxed and laid-back, yet close to all conveniences such as shops, bars, restaurants and lots of attractions. 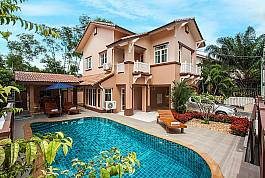 This 3-bedroom villa sits in an idyllic residential location in the heart of Huay Yai, a 10-minute drive to Downtown Pattaya and even less to Jomtien beach. With a private swimming pool and a modern interior, this villa sleeps 6 and is ideal for family holidays. Set in a residential development (project #2) in Ban Amphur, near to Silverlake Vineyard, this 3-bedroom villa sleeps 6 people. 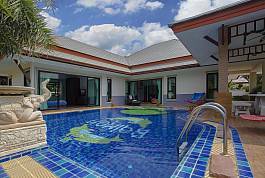 It comes with a private swimming pool with Jacuzzi jets, Thai sala, 3 bedrooms, 2 bathrooms, an open lounge, a neat and tidy garden, a dining area and kitchen. 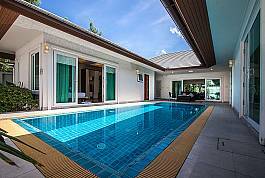 Located in a gated development just 2.9 km from Jomtien Beach, this modern 3-bedroom pool villa sleeps up to 6 people and enjoys a modern design and peaceful atmosphere. With a central location a short drive to the beach, bars and restaurants, this villa is perfect for families, groups and couples. Immerse yourself in utmost privacy on your Thailand getaway while staying close to everything the exciting city of Pattaya has to offer. This bright spread out villa comes with standalone rooms, big swimming pool, garden and Sala, and plenty of space for rest and relaxation. 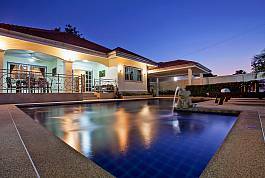 Kancha Villa is a 3-bedroom abode located in a quiet and secure area of Pattaya city. It is a two minute walk to the beach. The Villa has a stylish design, with a large private swimming pool as well as a communal pool located at the beachfront. Another great feature of this villa is that it has a fully equipped entertainment system for you and your group to enjoy a fun holiday!